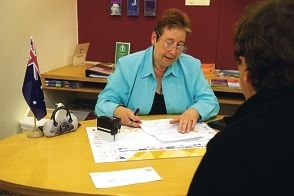 Wanneroo councillor and JP volunteer co-ordinator Dot Newton said the signing service was available from 9am to 1pm every week at the City of Wanneroo Civic Centre. However, the service is needing one or two more JPs to add their name to the roster. ‘Currently we only have enough to cover four Wednesdays a month and when someone is ill or away we are struggling to provide the service,’ she said. ‘Many JPs who are over 70 and cannot sit on the bench, or over 75 and cannot handle police paperwork, would be ideal for our signing room. Cr Newton said there was also a need for an after-hours service that could be provided for two hours on a Thursday evening. ‘This may suit JPs who are unable to volunteer during the day due to work commitments,’ she said. ‘Upon checking the Attorney General’s website there are in of excess of 30 JPs listed under the 6065 postcode. Cr Newton is calling for JPs who can spare four hours every six or seven weeks to call her on 0407 981 149.